Don’t let the flourless aspect put you off. These Truly Flourless Peanut Butter Chocolate Chip Cookies are EPIC!! Only 5 ingredients and minimal preparation is required for soft and gooey peanut buttery goodness. I received the ice cream in this post free of charge to sample and provide a review. All opinions are my own, and I only recommend products I would gladly use myself. I was like the biggest nerd in the world when Arctic Freeze offered to send me some ice cream on dry ice to sample. I spent the entire week anticipating the great unboxing, where this halloween-esque vapor would rise from the box, the kids would squeal with excitement, and then when they realized there was ice cream…well all bets would be off. Alas, the whole dry ice thing was a bit anti-climatic, there was no vapor, there were no swirls or squeals of delight…..initially. Then they realized that ice cream had been delivered right to the front door and they were gong to be allowed to eat it! So What’s the Deal with this Ice Cream that can be shipped to your door? Yes shipped to your door! Arctic Zero is handcrafted from premium ingredients like hormone-free whey protein, purified water, chicory root and completely natural flavors. Plus it is sweetened naturally using monk fruit (which is a small melon from Asia). It is low glycemic, lactose free, gluten free and GMO free. So it’s basically a delicious little ice-cold sweet treat that allows you to stay on track with your whole foods lifestyle and indulge at the same time. Win. We tried out a number of the flavors on offer, including Peanut Butter Swirl (my favorite and what I used for the Flourless Peanut Butter Chocolate Chip Cookies), Cherry Chocolate Chunk, Rocky Road Trip, Cookie Shake, Cake Batter and Salted Caramel. There are a heap more though, and you can check them out here: Arctic Zero Fit Frozen Desserts. I actually had a bunch of friends come over for July 4th and we had a big taste test along with some brownies. Everyone was impressed and went back for seconds, even those (my husband cough cough) who automatically puts something in the ‘No’ box once they hear it is lactose or gluten free. My Father In Law was particularly impressed as he has been trying to cut down on sweets and lose some weight, but has been having a hard time giving up his desserts. Listen to the instructions and let it thaw first!!! If you don’t, it’s not going to be creamy and it just isn’t nearly as good (speaking from experience here). Seriously, let it thaw, let it thaw, let it thaw. You can either pull it out of the freezer for 10 minutes or pop it into the microwave for 30 seconds, but it makes it so much better. Now for the peanut butter and chocolate chip cookies. They too are gluten-free, lactose free, non GMO and all that jazz (obviously depending on the specific branded ingredients you use). And they too had people coming back for more! The are incredibly soft and flavorful, and get that awesome chewy cookie texture if you can let them rest for a while once baked. They also make the perfect base for an ice cream sandwich. Once baked let them cool completely and stuff a big scoop of ice cream in between two cookies. EPIC. What do you think? Are you willing to try an ice cream made with no cream and sweetened with monk fruit? Are you super excited to try out some flourless peanut butter chocolate chip cookies and stuff them with ice cream? I love to hear from you, so be sure to leave a comment. Don't let the flourless aspect put you off. These Truly Flourless Peanut Butter Chocolate Chip Cookies are EPIC!! Only 5 ingredients and minimal preparation is required for soft and gooey peanut buttery goodness. Add the peanut butter, egg, maple syrup and vanilla extract to the bowl of a stand mixer. Using the paddle attachment, mix at medium speed until well combined, about 45 seconds. Pop the mixture into the fridge for 30 mins. Preheat the oven to 350F and grease a baking sheet, or line it with parchment paper. Remove the mixture from the fridge and stir in the baking soda and chocolate chips (I usually keep mine in the bowl of the stand mixer and then just mix with the paddle attachment again). Drop rounded tablespoons of the dough onto the baking sheet, making sure to keep at least 2 inches apart. I do about 8 per sheet to prevent them from touching. Bake for 12 minutes. Remove from the oven and allow to cool on the baking sheet for about 7 minutes before transferring to a wire rack to cool completely. I LOVE making peanut butter cookies! Loving the sound of both ice cream at my door, and these lactose free flavors! Peanut butter is my true weakness and these cookies look like the perfect accompaniment to ice cream. I can’t believe they have no flour! Will definitely check out Arctic Zero and make these cookies soon. Just a warning – ice cream to your door is dangerous 🙂 Peanut butter is an ultimate weakness around here as well, between my daughter and I we go through sooo much! I just had raw oysters delivered to my door the other day- I’m totally amazed by what you can get overnighted by clicking a button! And that ice cream cookie combo sounds AMAZING! Oh wow, now raw oysters would be amazing!! We can’t get much good seafood locally so I NEED to hear more!! The artic peanut butter ice cream is my absolute FAVORITE. I can’t wait to pair it with these cookies. 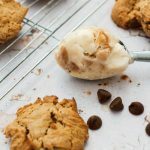 I don’t know what I think is cooler – the ice cream (pun intended), or the no-bake cookies! I’ve always loved peanut butter cookies, but I had no idea you could make them as a flourless cookie. They certainly look like they work gorgeously – and a layer of that delicious and surprisingly guilt-free ice cream is the perfect sandwich-filling! Glad you mentioned the thawing tip – I frequently forget (read: can’t wait) to do that, but it’s good to know that it makes such a difference here. Cheers! Haha first of all, LOVE the pun 🙂 Unfortunately the cookies DO have to be baked, but they are still flourless so thats a major plus in my books (esp. with a couple of gluten-free friends). Oh I am the worst when it comes to thawing, I have no patience at all when it comes to sweets, but it is a necessity with this ice-cream! These cookies were just begging to be made into ice cream sandwiches! Awesome flavor combo! My kids would go crazy for this recipe. I like this recipe for its flourless base which makes it gluten free. That way everyone can enjoy these cookies. The fillings and making it into an ice cream sandwich are over the top. Yes! We have a few friends with gluten sensitivities so it is always nice to have a treat we can share with them when they come over for dinner 🙂 My kids nearly died when they walked in to ice cream sandwiches for an afternoon treat! Direct to my door ice cream could be a dangerous thing… There’s just no accounting for the snack attack tendencies in our house. The ice cream sandwiches are a great idea too. I don’t follow a gluten free or dairy free regime, but many members of my family do, so this would be a great option when they visit! We don’t follow a gluten free or dairy free regime either, in fact I don’t think it would be possible in this house with the amount of bread we consume 🙂 We have some friends that do though, so I like to have something we can share with them for dessert when they come visit. Ice cream on the doorstep is definitely a dangerous thing! Printing and pinning. Love it!